Vancouver, British Columbia--(Newsfile Corp. - January 28, 2019) - North American Nickel Inc. (TSXV: NAN) (OTCBB: WSCRF) (CUSIP: 65704T 108) (the "Company") is pleased to report the results of a detailed geological, geochemical, and geophysical investigation to test the P-058 sulphide zone and the keel zone of the large Fossilik intrusion located centrally on the Company's 100% owned Maniitsoq nickel-copper-cobalt-PGM sulphide project in southwest Greenland. The melanorite keel area is interpreted to be the primary source of high grade mineralization previously identified in the P-058, P-059, and P-004 zones at the SW margin of the intrusion. The work was designed to establish whether the keel structure of the Fossilik intrusion has the potential to host a deposit that would surpass an economic hurdle for additional exploration and potential future development. 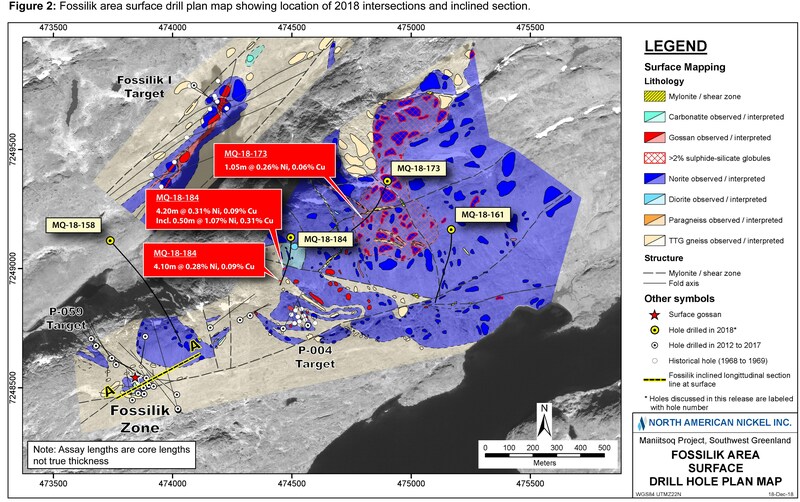 The 2018 exploration program at Fossilik integrated results from historic exploration that established a strong empirical relationship between the highest grades and tenors of magmatic sulphide mineralization and the distribution of high magnesium oxide (MgO) norite rocks, termed melanorites. Geochemical and geophysical data point to the importance of dense melanoritic bodies with elevated levels of MgO and chromium (Cr) as the principal repository of known magmatic sulphide mineralization. Moreover, the high conductive signature of mineralization comprising heavy disseminated, breccia, and massive sulphides makes this type of mineralization an exceptionally good target for deep-penetrating surface electromagnetic surveys (EM). Surface and drill core sampling completed in 2018 indicate that the base of the primary intrusion is located towards the southwest in an area of melanorites that are developed within the Fossilik intrusion inbound of the known mineral zones. The 2018 program of surface profile EM surveying, diamond drilling, and borehole electromagnetic (BHEM) survey work was designed to test the keel structure of the Fossilik intrusion and provide a new understanding of the potential of this structure to host highly conductive massive and disseminated sulphide mineralization that represent the possible source of the known mineral zones. Based on the results of the 2018 program and previous data, a detailed 3D model of this geological environment was constructed (figure 1). North American Nickel is convinced the Fossilik magma achieved the conditions required for sulphide saturation, however, the location and configuration of economically important concentrations of primary and remobilized sulphide mineralization remains unconstrained at this time. Drilling to date has yet to define the outermost halo of a cohesive magmatic sulphide body interpreted to represent the source of the multiple shallow high grade nickel sulphide zones occurring at Fossilik. Figures may be viewed using the link provided at the end of this release. NAN CEO, Keith Morrison, commented: "Our global understanding of sulphide mineralization associated with intrusions like Fossilik has provided the framework for the 2018 exploration program. The results of this work has established that the most prospective stratigraphy of the intrusion is located towards the southwestern corner where most of the known near-surface mineralization is situated. There is no doubt that this geological environment is prospective, but surface EM, drilling, and detailed geochemical studies confine the source of this mineralization to depth. The next steps at Fossilik will be the review of our economic model to determine a minimum deposit size and maximum depth, before justifying additional drilling." Three holes totaling 2,626.7m were designed and drilled following the surface melanorite mapping and deep penetrating EM program on Fossilik. These three holes (MQ-18-161, 173 and 184) were strategically positioned within the south western area of the intrusion. The fourth drill hole MQ-18-158, was designed to test the margin of the main Fossilik Intrusion adjacent to the P-058 mineral zone (see News Release dated November 23, 2017). This area represented the possible link to the source of the remobilized sulphides with high Ni tenor that occur at P-058. Further details of the drilling completed at P-058 are given below. Hole MQ-18-158 was drilled to a depth of 797m but did not intercept any significant mineralization. However, the follow up BHEM survey indicated that the P-058 zone continues further at depth along its known mineralized trend identified in 2017. The overall footprint of the P-058 mineralization is now interpreted to extend from surface to a depth of 695m based on BHEM results and remains open at depth (figure 2). 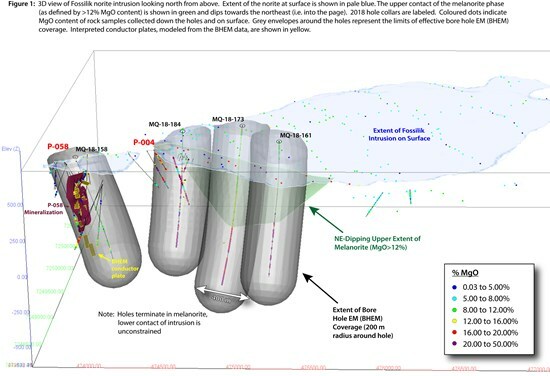 The surface mapping and geochemistry coupled with the three holes (MQ-18-161, 173 and 184) drilled into the south western part of the Fossilik intrusion now confirms, that, the most prospective keel portion remains unconstrained at depth as it lies below the bottom of drill hole MQ-18-173. Although, the 2018 work program did not identify significant mineralization in the keel structure of the intrusion, the potential for a discovery at depth remains open, and the data continues to help vector towards mineral zones at the boundary of the intrusion and within the adjacent gneiss units.